Want to learn how to find overnight stops as you travel? Touring France in a Motorhome- things to bring; campsites; Menton Lemon Festival & Millau! We set off for Menton late on Friday afternoon, which was later than planned but couldn't be helped. Happily, rush hour in central France is nowhere near the chaos of Southern England, and we plodded along quite nicely. We have a new motorbike trailer for this adventure – it's got a solid base and suspension, which is the ultimate luxury. So far, it's going very well and apparently doesn't bounce as much as our old one. Time (and miles!) will tell. We had no destination in mind for an overnight stop, so as darkness pulled in, I started looking for a suitable spot and found one about an hour north of the viaduct. The instructions were supposed to take you down a small slope and park under a bridge, but night had truly fallen when we arrived, so we missed the turning completely. Happily, there was a picnic area just the other side of the bridge and we pulled in there for dinner and a well-earned rest. We thought we'd give it an hour before deciding whether or not to stay for the night, but it was practically deserted, with only one car passing us and no pedestrians. I decided sleep was more important than training, so I let him on the bed with us- that will probably prove to be a mistake in days to come! Annoyingly, I didn't sleep particularly well after that as I was so worried about him falling off the side of the bed! After a decent breakfast of bacon and egg sandwiches, we headed off for Millau! The Millau bridge is on the A75, which is technically a motorway, but be careful if passing that way in winter- the road is high and can get blocked by snowfalls. Also, try and avoid the area in July and August if at all possible- the queues are horrendous! I wasn't entirely sure what to expect from the World's Tallest Bridge, but it blew my tiny mind anyway. The thing is HUGE! It cost us 12.90€ to cross in a motorhome (I believe it's more expensive in July & August!) and our tollpass worked fine. Sadly, the weather wasn't amazing- drizzle and low cloud, but there was enough of a view to see down the valley and the winds weren't strong enough to close the bridge, which was good! The road opened up and we found a lovely parking spot for lunch, with great views of the bridge. It really is an incredible piece of engineering! Trying to find the Millau Viaduct with a motorhome! Happily fed and watered (not sure I'll ever get tired of crusty bread and cheese! ), we resumed course for Menton. As we were driving, I realised something slightly worrying- there are very very few camping spots along that coastline. We were looking for a campsite or an aire, as we wanted to ride on the motorbikes if weather permitted, but it seemed as if most of the campsites hadn't opened yet (early March). This was an unpleasant surprise, and one of the downsides to not planning/ booking things in advance. Still, there is always a solution. We found an open campsite just over the border in Italy, about 15 minutes from Menton, but it was full. The owner did offer to try to ‘squeeze us in'… until we explain we were 7.5m with a 3m trailer. “Oh.” was the reply! Caravan or Motorhome- which is best for you? Still, we kept searching and, eventually, we picked one just north of Nice- Camping Magali. This was a rustic French campsite, with crazy electrics (not sure how safe they were!) and toilets I will never use… (you can see them in the video!) But it was a safe enough base for a couple of days for us to leave the motorhome while we explored on the bikes. We set up a long lead for Mac in the sunshine and unloaded the bikes from the trailer, giving them a good clean afterwards. Our new trailer is going well, although one of the straps at the back keeps coming loose and my gear lever hit the wheel arch at some point; we need to play with the straps to get them right. But it survived being pulled down a tiny road and even had to reverse… all without a problem. Bikes aren't staying much cleaner though- we decided to try without covers but we might need to add them back on again! Quick dinner of French sausages and salad and we're all ready for a good night sleep before our big adventure with lemons tomorrow! We also share tips for taking your motorhome to France, dealing with the Gilet Jaune and other useful info. Just click below to watch. 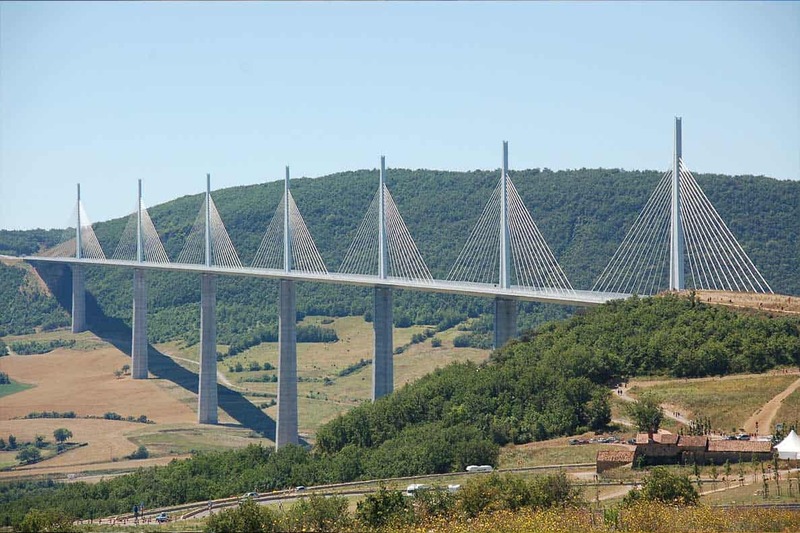 Have you ever crossed the Millau viaduct, in a motorhome, car, bike or anything else? Did you have better weather than us? We'd love to hear your story. Want to save this for later? Here's the pin. Enjoyed this post? We'd love it if you shared it on Facebook, Twitter or Pinterest. Thank you! How to Visit the Rhine Falls- 10 things you need to know! I also have a husband who manages to sleep through any noise at all, especially when our dog was a puppy and was a very early riser! I can sympathise. Our dog has now learnt that with a run up he can jump on our fixed bed so even though he is now three we still get early morning wake up calls!